Increasing communities' participation in development processes has been the subject of both policy aspiration and scholarly critique. 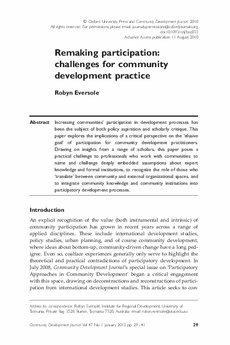 This paper explores the implications of a critical perspective on the ‘elusive goal’ of participation for community development practitioners. Drawing on insights from a range of scholars, this paper poses a practical challenge to professionals who work with communities: to name and challenge deeply embedded assumptions about expert knowledge and formal institutions, to recognize the role of those who ‘translate’ between community and external organizational spaces, and to integrate community knowledge and community institutions into participatory development processes.